“American investors lack basic financial literacy,” according to a new report from the Securities and Exchange Commission (much of which is based on an earlier report by the Congressional Research Service at the Library of Congress). Many fail to grasp compound interest, don’t understand fees and other investment costs, and aren’t aware about the risks of investment fraud. The report goes on to discuss ideas for increasing financial literacy and increasing the transparency of fees and other investment costs. People sometimes talk about financial literacy as though the goal is helping people choose their own investments. That can be helpful, but the report rightly discusses another goal: improving consumers’ ability to work with financial advisors. P.S. For a brief discussion of financial literacy and mortgages, see this post from 2010. That spike did happen. But as every economic data jockey knows, it doesn’t reflect the stimulus; it’s temporary hiring of Census workers. Ferguson ought to know that. He’s trying to position himself as an important economic commentator and that should require basic familiarity with key data. Data rarely speak for themselves. There’s almost always some folklore, known to initiates, about how data should and should not be used. As the web transforms the availability and use of data, it’s essential that the folklore be democratized as much as the raw data themselves. How would that democratization work? One approach would be to create metadata for key economic data series. Just as your camera attachs time, date, GPS coordinates, and who knows what else to each digital photograph you take, so could each economic data point be accompanied by a field identifying any special issues and providing a link for users who want more information. Clicking on or hovering over the “2” would then reveal text: “Federal employment boosted by temporary Census hiring; for more information see link.” And the stimulus mistake would be avoided. I am, of course, skimming over a host of practical challenges. How do you decide which anomalies should be included in the metadata? When should charts show a single flag for metadata issues, even when the underlying data have it for each affected datapoint? And, perhaps most important, who should do this? It would be great if the statistical agencies could do it, so the information could filter out through the entire data-using community. But their budgets are already tight. Failing that, perhaps the fine folks at FRED could do it; they’ve certainly revolutionized access to the raw data. Or even Google, which already does something similar to highlight news stories on its stock price charts, but would need to create the underlying database of metadata. Here’s hoping that someone will do it. Democratizing data folklore would reduce needless confusion about economic facts so we can focus on real economic challenges. 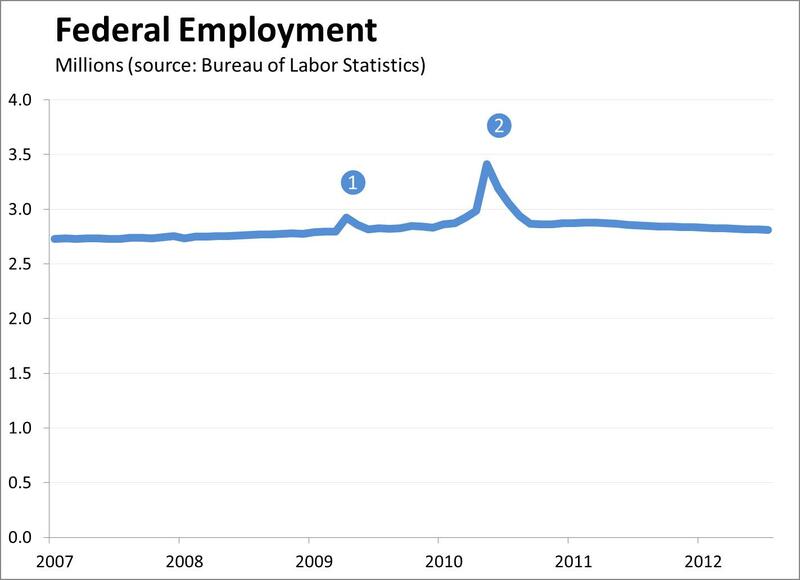 And it just might remind me what happened to federal employment in early 2009. 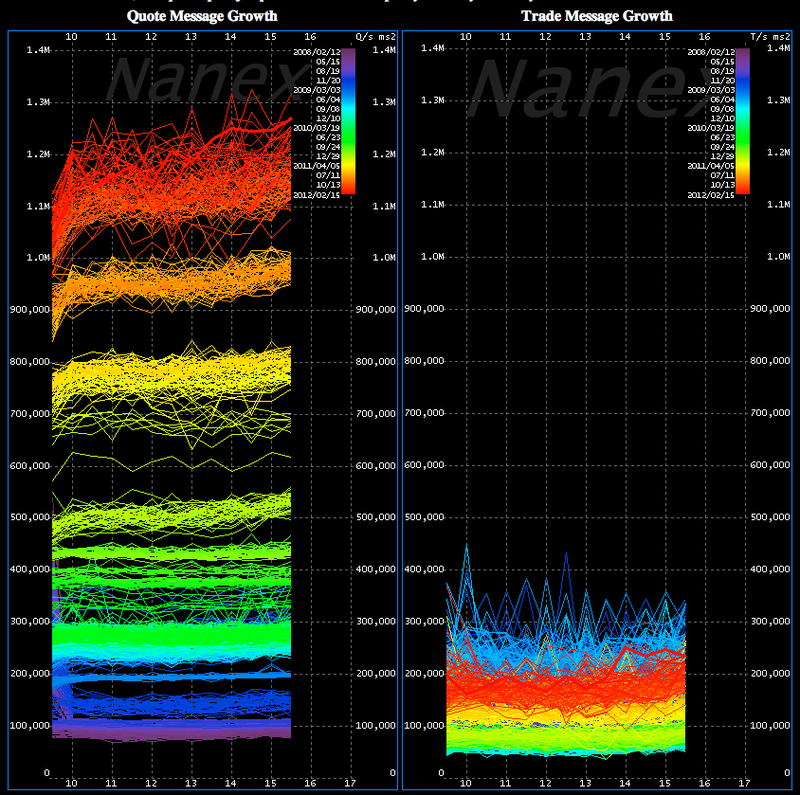 On Monday, I posted a lovely animated gif from Nanex showing the rise of high-frequency trading. What I failed to mention is that graph doesn’t show completed trades. It shows quotes. Each day is plotted in a separate color over the course of a trading day (9:30 to 16:00 Eastern): older data uses colors towards the violet end of the spectrum, recent data towards the red end of the spectrum. The gaps you see between color groups on the quote chart (left-side) is when system capacity was upgraded to handle the increase in traffic, and quote spam jumped to fill the new capacity that very same day. The number of unexecuted quotes, many allegedly not intended to be executed, has thus skyrocketed. France recently took steps to try to deter the rise in quotes. In addition to a financial transactions tax it, France will also impose a tax on traders who submit too many unfilled quotes. In short, France will levy a financial non-transaction tax. The Tax Policy Center’s latest research report went viral last week, drawing attention in the presidential campaign and sparking a constructive discussion of the practical challenges of tax reform. Unfortunately, the response has also included some unwarranted inferences from one side and unwarranted vitriol from the other, distracting from the fundamental message of the study: tax reform is hard. The paper is the latest in a series of TPC studies that have documented both the promise and the difficulty of base-broadening, rate-lowering tax reform. Last month, for example, Hang Nguyen, Jim Nunns, Eric Toder, and Roberton Williams documented just how hard it can be to cut tax preferences to pay for lower tax rates. An earlier paper by Dan Baneman and Eric Toder documented the distributional impacts of individual income tax preferences. The new study applies those insights to Governor Romney’s tax proposal. 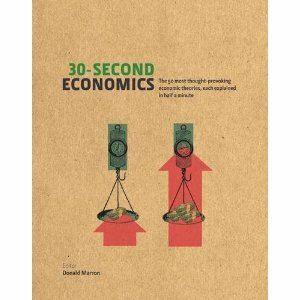 To do so, the authors had to confront a fundamental challenge: Governor Romney has not offered a fully-specified plan. He has been explicit about the tax cuts he has in mind, including a one-fifth reduction in marginal tax rates from today’s level, which would drop the top rate from 35 percent to 28 percent and a cut in capital gains and dividend taxes for families with incomes below $200,000. He and his team have also said that reform should be revenue-neutral and not increase taxes on capital gains and dividends. But they have not provided any detail about what tax preferences they would cut to make up lost revenue. As a political matter, such reticence is understandable. To sell yourself and your policy, it’s natural to emphasize the things that people like, such as tax cuts, while downplaying the specifics of who will bear the accompanying costs. Last February, President Obama did the same thing when he rolled out his business tax proposal. The president was very clear about lowering the corporate rate from 35 percent to 28 percent, but he provided few examples of the tax breaks he would cut to pay for it. Such is politics. For those of us in the business of policy analysis, however, this poses a challenge. TPC’s goal is to inform the tax policy debate as best we can. While we strongly prefer to analyze complete plans, that sometimes isn’t possible. So we provide what information we can with the resources available. Earlier this year, for example, we analyzed the specified parts of Governor Romney’s proposal and documented how much revenue he would have to make up by unspecified base broadening (or, possibly, macroeconomic growth) and how the rate cuts would affect households at different income levels. The latest study asked a different question: Could Romney’s plan maintain current progressivity given revenue neutrality and reasonable assumptions about what types of base broadening he’d propose? There are roughly $1.3 trillion in tax expenditures out there, but not all will be on Governor Romney’s list. He has said, for example, that raising capital gains and dividend taxes isn’t an option and has generally spoken about lowering taxes on saving and investment. Based on those statements, the authors considered what would happen if Romney kept all the tax breaks associated with saving and investment, including not only the lower rates on capital gains and dividends, but also the special treatment for municipal bonds, IRA and 401ks, and certain life-insurance plans, as well as the ability to avoid capital gains taxes at death (known as step-up basis). The authors also recognized that touching some tax breaks is beyond the realm of political possibility, such as taxing the implicit rent people get from owning their own home. Given those factors, the study then examined the most progressive way of reducing the other tax breaks that remain on the table—i.e. it rolls them back first for high-income people. But there aren’t enough of those preferences to offset the benefits that high-income households get from the rate reductions. As a result, a revenue-neutral reform within these constraints would cut taxes at the high-end while raising them in the middle and perhaps bottom. What should we infer from this result? Like Howard Gleckman, I don’t interpret this as evidence that Governor Romney wants to increase taxes on the middle class in order to cut taxes for the rich, as an Obama campaign ad claimed. Instead, I view it as showing that his plan can’t accomplish all his stated objectives. One can charitably view his plan as a combination of political signaling and the opening offer in what would, if he gets elected, become a negotiation. To get a sense of where such negotiation might lead, keep in mind that Romney’s plan is not the first to propose a 28 percent top rate. The Tax Reform Act of 1986 did, as did the Bowles-Simpson proposal and the similar Domenici-Rivlin effort (on which I served). Unlike Governor Romney’s proposal, all three of those tax reforms reflect political compromise. And in all three cases, part of that compromise was eliminating some tax preferences for saving and investment, which tend to be especially important for high-income taxpayers. In particular, all three reforms resulted in capital gains and dividends being taxed at ordinary income tax rates. TPC’s latest study highlights the realities that lead to such compromises. 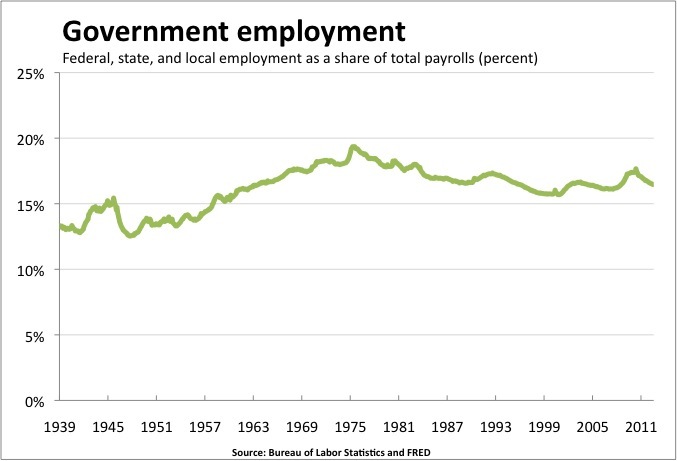 My recent post on government size prompted several readers to ask a natural follow-up question: how has the government’s role as employer changed over time? In July, governments accounted for 16.5 percent of U.S. employment. That’s down from the 17.7 percent peak in early 2010, when the weak economy, stimulus efforts, and the decennial census all boosted government’s share of employment. And it’s down from the levels of much of the past forty years. On the other hand, it’s also up from the sub-16 percent level reached back in the go-go days of the late 1990s and early 2000s. P.S. Like my previous chart on government spending, this one focuses on the size of government relative to the rest of the economy (here measured by nonfarm payroll employment). Over at the Brookings Institution’s Hamilton Project, Michael Greenstone and Adam Looney find a more severe drop in government employment than does my chart. The reason is that they focus on government employment as a share of the population, while my chart compares it to overall employment. That’s an important distinction given the dramatic decline in employment, relative to the population, in recent years. P.P.S. As Ernie Tedeschi notes, this measure doesn’t capture government contractors. So any change in the mix of private contractors vs. direct employees will affect the ratio. This is another reason why focusing on spending metrics may be better than employment figures.